The summer of 2010 found me traveling up old Rt. 20 in central New York State. It’s a nice ride. It really is. I’m not sure if I would call it exciting or spectacular or some other superlative to show my extreme enthusiasm, but it’s certainly not stressful, and there’s lots to see and do. I recommend it for when you lack a destination. Traveling to the west of Sharon Springs toward Cherry Valley it was getting near lunchtime, and I was traveling fairly blind. I knew there was some stuff to see out here but I didn’t really have any details, and I had no info about food whatsoever. 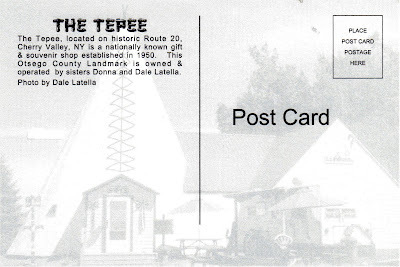 What I did know was that there was supposedly some kind of big tepee along the road somewhere up ahead. After a little while more of driving I spotted something a bit further down the road coming up over the horizon. 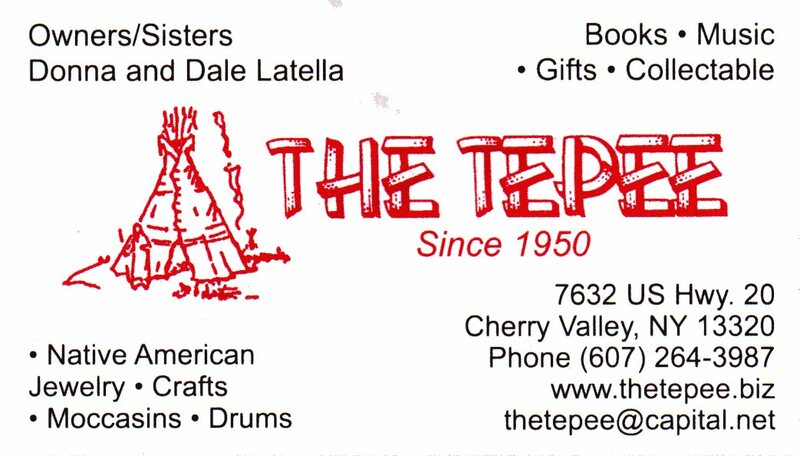 It was definitely pointy at the top, so I figured I had found my tepee. I wasn’t wrong. It turned out to be a just what I was looking for after a long morning of sightseeing. 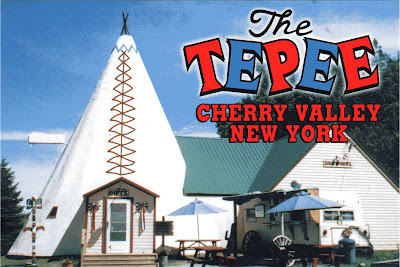 As I pulled off the road into the parking area, the first thing that I noticed was the very large tepee that dominates the property. Second is the incredible view of the vast Mohawk Valley visible across the road. For those who are into Native American gift shops, The Tepee is your kind of place. Inside you can find just about anything imaginable related to the theme. 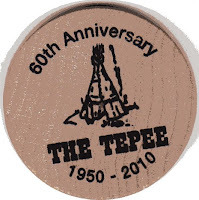 For those of us who collect roadside attraction souvenirs The Tepee definitely needs more stuff with its own name on it. Aside from a tiny snow globe emblazoned with “The Tepee” and a wooden nickel, there's not much in the way of self-promotion. 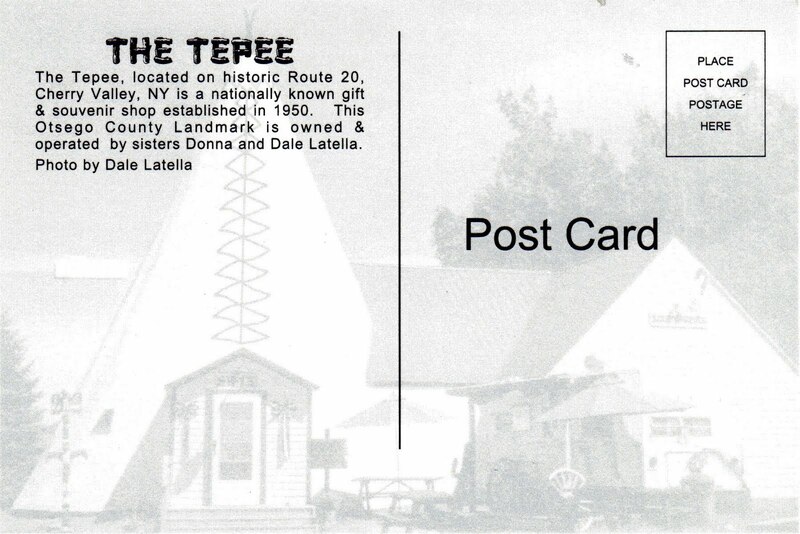 The shop is run by Donna, one of three siblings who own and operate The Tepee. 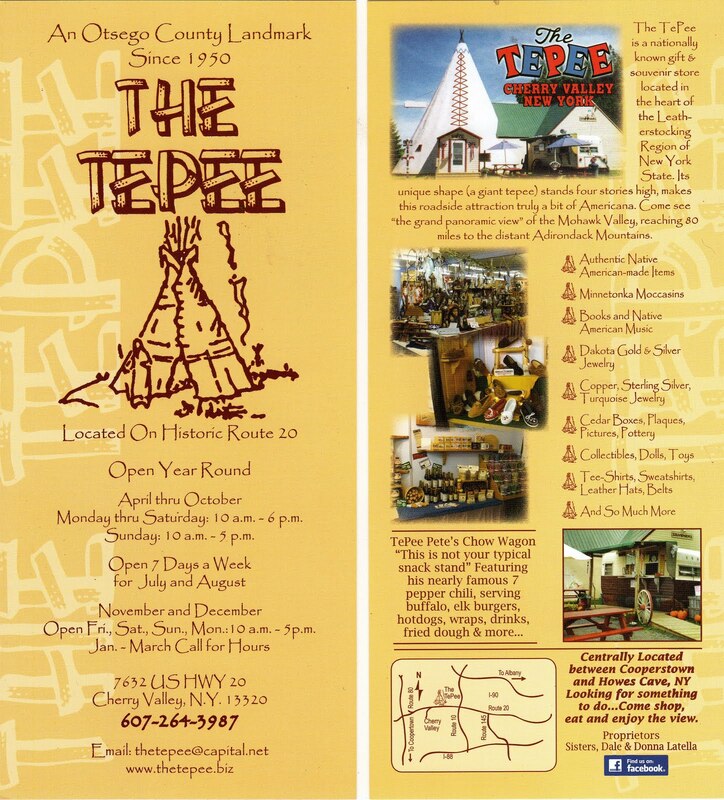 She was full of all kinds of good information about The Tepee and its history. When we were all done inside Donna suggested we go outside to visit Pete and Dale, her two siblings who were making lunch in the chow wagon. Chow wagon? Nestled in alongside the Tepee was the most welcomed sight of all, an old weathered travel trailer that was converted into a fully functioning kitchen. The sounds and smells coming out of it all just screamed LUNCH. 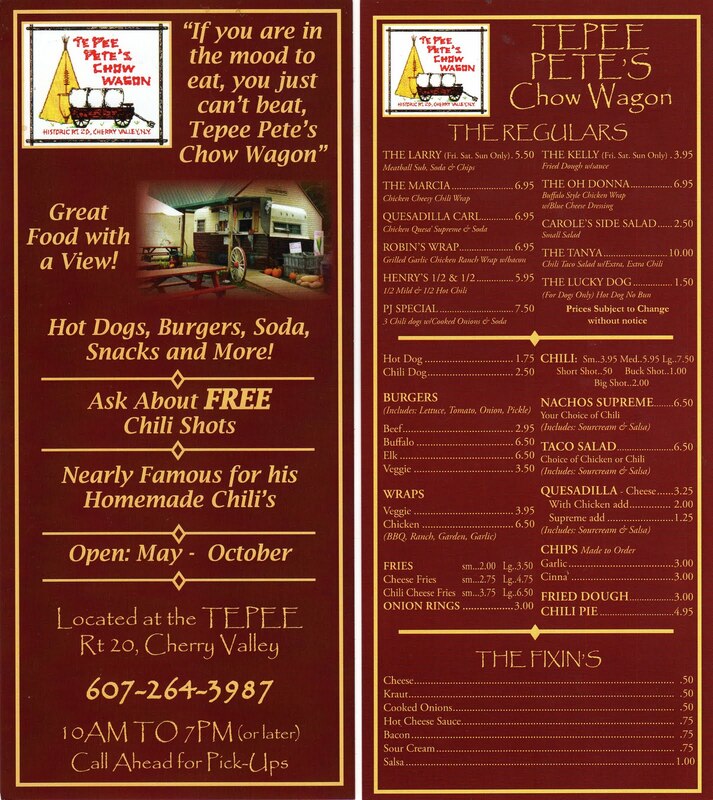 This was my introduction to Tepee Pete’s Chow Wagon. 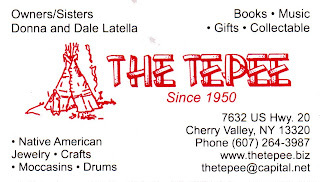 Inside were Pete and his sister Dale preparing a batch of Tepee Pete’s world famous Ommegang Brewery Beer Chili. 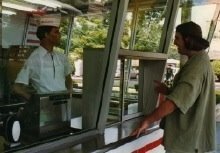 And like any enterprising chili pusher, Pete offers up the first shot for free. Not wanting to miss out on a potentially life-changing chili experience, I ordered up a shot for myself and was rewarded with a heaping and steaming soufflé cup of some of the best chili I’ve tasted. It was sweet with some creeping heat on the back end. 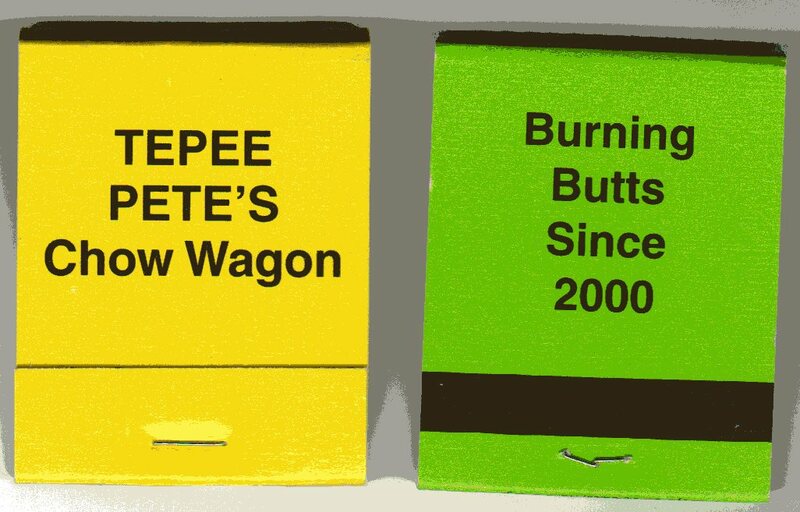 Pete calls it a shot for a reason. 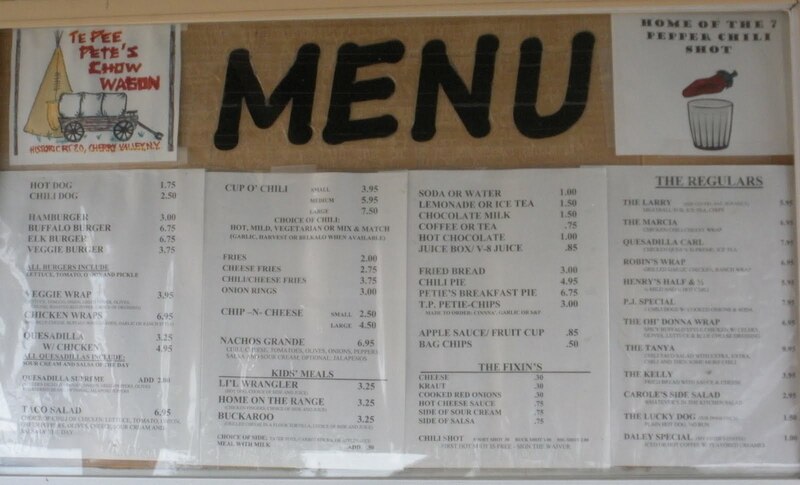 The soufflé cup of chili is free, but if you want a fork it will cost you. 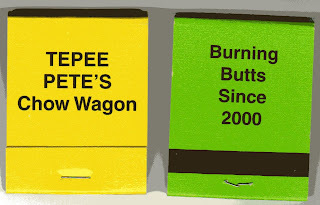 Once introductions were made, Pete was more than happy to tell the story of The Tepee, the Chow Wagon, and all about his food. It sounds best coming right from him so I recommend that you go and let him tell you himself. You won’t be disappointed. The menu is simple, yet fun and hangs in the window of the Wagon right above the counter. Finally it was time to eat. I ordered “The Kelly”, which is fried bread with sauce and cheese. I went with a variation that included freshly shredded mozzarella and tomato sauce. And having been sufficiently tempted by my shot of chili, I decided to officially order a full cup of it to top off my meal. My companion went with a quesadilla of fresh peppers and mozzarella cheese. When lunch was served we were offered an additional plate of tortillas, lightly fried and tossed in cinnamon and sugar. It was just right to finish off the meal. My “Kelly” was essentially a pizza fritté with the fried bread acting as the crust. The hot bread, cold sauce, and slightly melty cheese were a nice take on the theme. The chili was, as earlier stated, some of the best I’ve had. The fresh pepper and mozzarella quesadilla was the kind you always want but never seem to get. It was super-fresh and not at all greasy. The same goes for the fried bread. When lunch was over we all said our goodbyes. I don’t usually mention that I write about stuff, but this time I did. 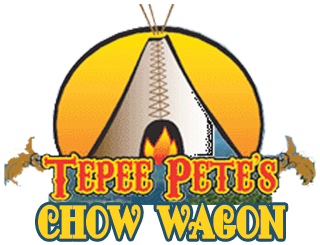 I promised that no matter how long it took, the next blog post I wrote would be about The Tepee & Tepee Pete’s Chow Wagon. We piled into the car and pulled back onto Rt. 20 heading west. The next stop would be The Petrified Creatures Museum of Natural History. It’s an old dinosaur park that’s been around for over 70 years. There used to be quite a lot of these places around the country tempting travelers with a glimpse of an extinct and ferocious world. Sadly, today attractions like this are few and far between. They began to decline at the end of the great roadside era when the interstate began to bypass the old attractions. As science and technology grew over the last half-century people became less enamored of the simple presentations, preferring high-tech demonstrations of sound and motion. Today you can find mini-golf displays that surpass the excitement of some the old dinosaur parks. Still, it’s the whimsical simplicity of these places that sparks the imagination of their many visitors. The Petrified Creatures Museum of Natural History comes replete with brightly painted, handmade dinosaurs and really silly audio stations for each one. As you walk around the park, be sure to open the mailboxes by the dinosaurs. Each one tells the tale of its dinosaur companion. You can also dig for your own fossils in the shale pit out back. Along the outer walls are sheltered stations where audio tells you the prehistoric tale of the area and explains each of the fossils displayed on the walls. The gift shop is your first and last stop on the way in and out. In it you will find every dinosaur related gewgaw imaginable from the educational to the childish to the downright odd. Sadly, you won’t find too many items specifically branded for the museum itself. A chat with the nice lady who owns and runs the museum filled us in on quite a bit of its history. Her late husband did most of the sculpting of the dinosaurs, and upkeep of the grounds. These days she just comes up from Florida for the summertime to open the museum for the season. 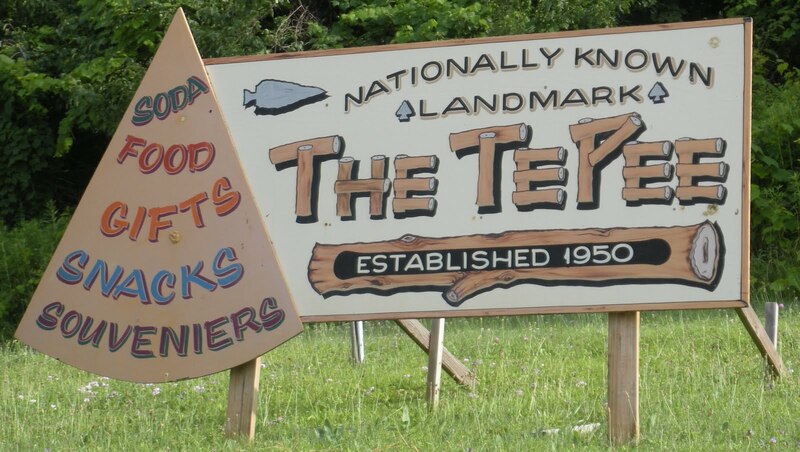 If you are in the market to own a roadside attraction, this could be your opportunity. They are looking to sell the whole kit and caboodle; from the grounds to the sculptures and displays, to the buildings and the gift shop with its contents. The sale also includes the museum’s not-for-profit status. 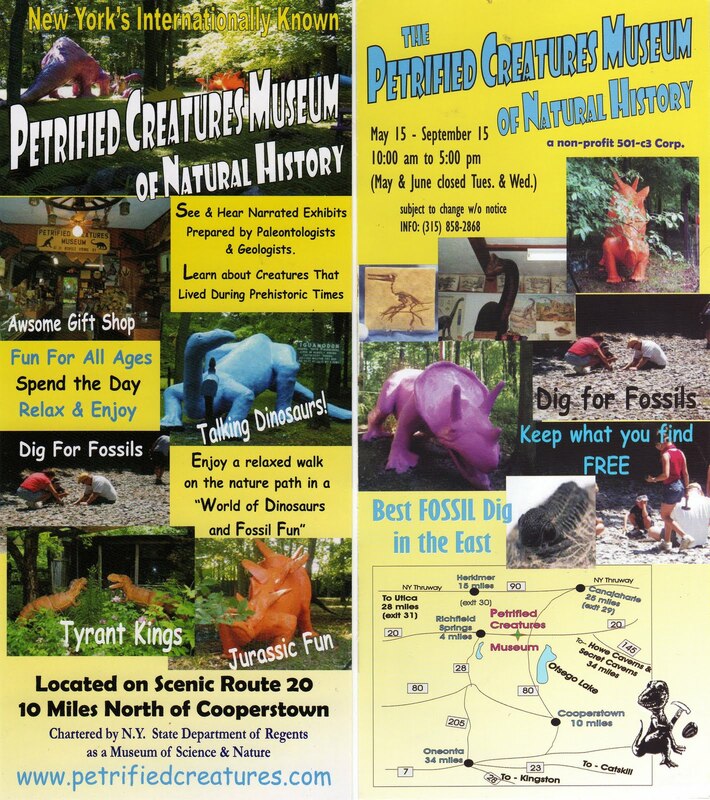 For a more detailed story of The Petrified Creatures Museum of Natural History, check out our friends over at Project Absurd. They visited not once, but twice and have lots of pictures and even a cool little video that shows what it’s like to hear the tales from the dinosaurs’ mailboxes. The Tepee and The Petrified Creatures Museum of Natural History are just two of the amazing things to do and see along the road. So the next time you find yourself traveling on Rt. 20 in Upstate New York, stop and check out the sights for yourself. You’ll be glad you did. 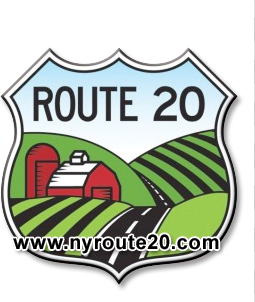 For a full rundown of what the highway has to offer check out the Route 20 Association of New York State. Click here to get Eating with George updates sent to your email address. One of my favorite things to do is travel around the country just to see what there is to see. As it turns out, there’s quite a bit. At the top of my list of stuff to check out are wacky roadside tourist traps and big, over-sized (usually fiberglass) statues. A close second is food. 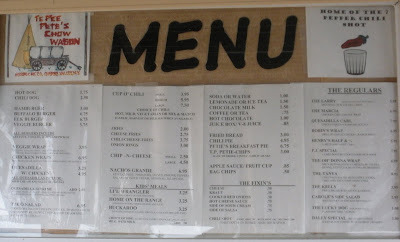 I always keep my eye out for menu items that seem to stand out for one reason or another. And if it's some kind of featured burger, well, all the better. As my adventures continue, I’ll be sharing some of them here with you. Most of the focus will probably be in and around New Jersey, but I tend to pop up all over the place as opportunities arise. There are a lot of great little places to eat all over the NJ area. I can only hope to hit as many as possible. And remember, we are all that stand in the way of the corporate homogenization of the eating landscape in our nation. Sure, I eat at those places sometimes. We all do. But we should also patronize the little guy. The one whose only location is right here. The one who’s doing something right here that isn’t being done quite the same way anywhere else. If we want these places to stick around, we need to eat at them. I intend to do my part.